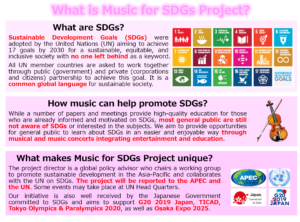 We are delighted to inform you that we have launched “Music for SDGs” Project with the following objective: Under the slogan of “No one will be left behind!”, aiming to provide opportunities for the general public to deepen understanding of SDGs in an easier and enjoyable way through music events integrating entertainment and education. 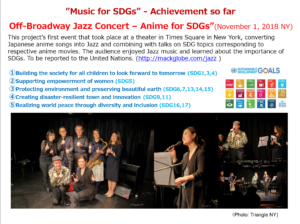 As the first event, we successfully organized “JAZZ Concert – ANIME for SDGs” on November 1, 2018 at Crown Theater in Times Square, New York, where Japanese Anime songs were performed by jazz musicians, combined with talk shows on SDGs. 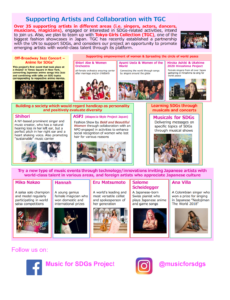 In 2019, taking this opportunity of having G20-related events and TICAD in Japan, we are planning to hold a music event inviting various artist (i.e. musicians, dancers, models, magicians) and including music with diversity (i.e. 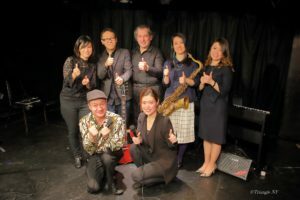 jazz, rock, Japanese instruments, Latin music). We are also planning other events back to back to Tokyo Olympic & Paralympic, Osaka Expo, UN events, etc. 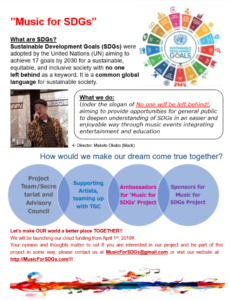 To achieve our objective above, we have established the Secretariat, and are seeking sponsors, collaborators and advisors who support SDGs and share our objectives. 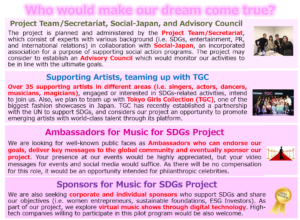 Especially, we aims to find charitable and philanthropic celebrities as Ambassadors for our project.